A WOMAN WHOSE HEART WAS AS FIERCE AS IT WAS FRAGILE….. AND THE MAN WHO BOUGHT HER TO WIN IT. The enigmatic Hurley Twins were selling her…and Miss Elspeth James had no choice but to accept. As governess to the Canvases, she prepared the girls to be sold as living art, prepared them to become legendary Painted Sisters to some of the world’s most influential and powerful men, The Collectors. She would have walkout out, left the Hurley twins, her beloved charges and the ridiculous proposal but the girls were in serious danger. 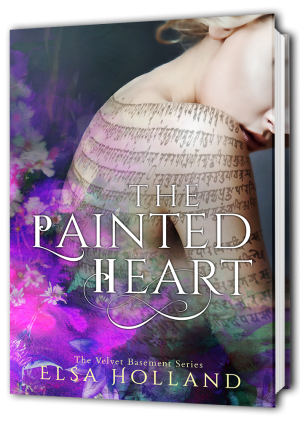 There were whispers a diabolical outlawed sect, a Skinner…of secret bidding, astronomical prices for the beautiful tattooed skin minus the girl. If she accepted the deal to become his Painted Sister, the arrogant, cold and infuriatingly handsome Mr. Blackburn, she could do something to protect the girls, to protect her friends. That, was worth doing the unimaginable for. That was worth fighting the way he made her body feel even as he hated him. Mr Blackburn, a rudely wealthy self-made man, had connections at every level of society and he wanted more. Having a Painted Sister would rise him higher in the elite world of ‘The Collectors’, men who like him operated over and above the rules of society. Yet on meeting Miss James…. he wanted more. He pushed her to sign over her virtue as well as become his Painted Sister, pushed her to override her distaste for him and taste what passion felt like. The trouble was… she made him hunger for something he’d never wanted and never believed in … Could she love him? Would she ever reach out and touch him with the same need that thumped through his veins every moment of every day since the first time they met? THE HEART DOESN’T RESPOND TO THE MIND AS A MASTER TO A SERVANT, IT WALKS ITS OWN PATH….IT DEMANDS EVERYTHING, EVERYTHING A PERSON IS AND EVERYTHING THEY THOUGHT THEY’D LEFT BEHIND. This is at the very start of the book when Miss Elzpeth James, Governess to the Hurley twin’s collection of girls, is showing her charges to a potential benefactor, Mr Blackburn a self-made man climbing up the rank of the elete group called The Collectors. Elzpeth stepped back, took out the small note pad she kept in her pocket and wrote what she hoped would be helpful advice. She passed the note off to a servant stationed at the side and then moved back into position at the back of the viewing platform. Mr. Blackburn’s eyes flicked over to her as she moved. That gaze was sharp, a harsh and penetrating force that sent shards through her chest and pierced her to the spot. She was saved from his perusal when her note arrived. He opened it, read it and then screwed it up letting it drop by the chair as he looked at her again. This time there was something far more disturbing about the way he looked at her, something she couldn’t quite understand that made her skin feel suddenly hot and tight over her bones.